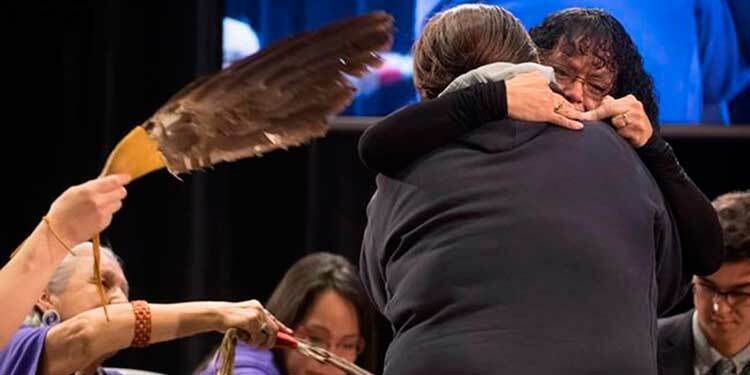 Trudy Smith, right, receives a hug following her testimony about her murdered sister Pauline Johnson during the National Inquiry of Missing and Murdered Indigenous Women and Girls in Richmond, April 6, 2018. Sunday was a powerful final day of testimony in the National Inquiry into Missing and Murdered Indigenous Women and Girls in Richmond. The morning’s message was clear; too many Indigenous women and girls are being murdered and their murders ignored. It has to stop. Canada, and the men who run First Nations, need to step up with law enforcement. There must be more support for the Indigenous females of this land. Speaking to a rapt audience was Bernie Williams, the Haida grandmother who went on seven long walks with other Indigenous women and who walked the Highway of Tears twice to raise awareness about the 4,000 women and girls who have gone missing or are known to have been murdered in Canada. The large group of Indigenous women sat silent, absorbing Williams’ every word, in the grand room of Richmond’s Sheraton Vancouver Airport Hotel. Williams’ mother and three of her sisters each died violently, not a common statistic for non-Indigenous women but an all-too-common one for the women gathered at the inquiry. She spent 30 years advocating and helping the women of the Downtown Eastside (DTES) of Vancouver. Williams said all levels of government are spending $1 million dollars per day there in what she called an industry of support that perpetuates itself but doesn’t help the women substantially. She demanded a health and wellness centre be established in the B.C. Interior so women and girls can go there the day they ask to leave their life on the DTES, so they can receive physical and spiritual healing, and learn to live healthier lives for their future and their families’. The inquiry has crossed Canada, hearing testimony from those who have lost beloved family members to violence. The tears of those speaking and of those listening, absorbed by the tissues placed around the hearing rooms, were collected in paper bags and burned in the sacred fire with ceremony each day. Speaking of just one of the practicalities to reduce the number of missing and murdered Indigenous women, Odette sighed and then spoke of the need for good rural bus service so women and girls do not need to hitchhike to get to the city for doctors’ appointments, grocery stores or hospital care. Many of those who disappeared on B.C.’s Highway of Tears were hitchhiking because they had no car and there was no other way to get to town. She talked of Saskatchewan’s impending decision to cancel rural bus routes. Were non-Indigenous women and girls at the same risk for being disappeared or murdered, five girls out of every high school could expect their lives to end violently. Many families would lose a mother to violence, or a sister, or two. The message at the inquiry was clear; this is a big problem that non-Indigenous Canadians need to wake up to and need to take concrete steps to change the trend. People in Europe in the 1930s and first half of the 1940s said they didn’t know what was being done to Jews, Roma, the disabled, GBLT2Q people and political opponents who were being murdered and disappeared. According to inquiry attendees, Canadians have turned a blind eye to the problem of Indigenous women dying in large numbers. Sometimes, these women and girls are listed as disappeared, usually because their bodies have never been found. Sometimes, it is because their death by manual strangulation, by gunshot wound to the back of the head, or by drowning wrapped in a rug and weighted down, is listed as suicide. For years, people have said these women didn’t want to be found. It happened when a serial killer walked the streets of the Downtown Eastside of Vancouver. Yet, women at the inquiry talked of their escapes from Willy Pickton’s violence, of telling workers and police about him, to no avail. A year ago, there was a radio documentary on the many suicides by drowning in Indigenous youth who left their rural communities to go to high school in Thunder Bay. The parents were perplexed because their children didn’t seem unhappy. When one teen survived being attacked and thrown into the river by non-Indigenous people, Thunder Bay police began to investigate. Asked what non-Indigenous people can do to bridge the gap, Odette said that we should not be afraid to reach out, to ask questions, to learn about each other, to walk beside each other. She suggested attending a pow wow, going to a public gathering like Aboriginal Veterans’ Day where all will be welcomed. Back in the inquiry, as Williams spoke her truth, the crowd was usually quiet. Occasionally, the crowd rose to their feet applauding at what she had to say, while other times, as Williams and Commissioner Odette hugged, the room fell silent.